In today's intense business climate, often only competitive pricing and quality customer service can set a company apart from the competition. One powerful technology designed to assure both is the computerized shipping system, interfaced real-time to a shipper's general business and accounting system. Computerized Shipping Systems details how shippers can utili9ze such systems to significantly improve shipping options and reduce costs, while dramatically improving customer and staff satisfactionand enhancing profitability. 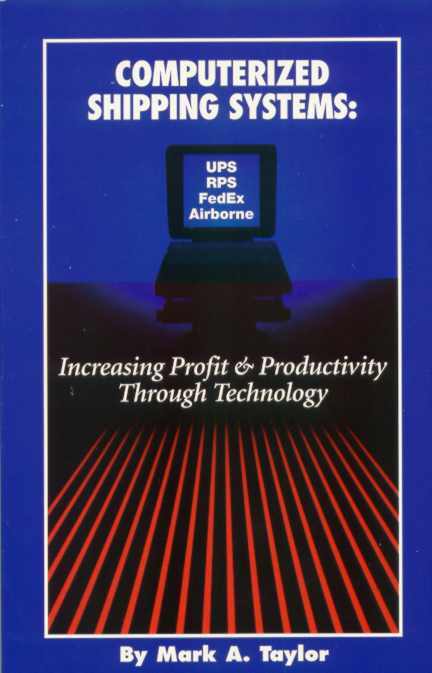 In this book, you will learn how to turn the shipping room from a cost center into a profit center; how to improve customer satisfaction; how to purchase a computerized shipping system; the inside story on what the carriers don't tell you. What Is a Computerized Shipping System? Over the past decade, as computers have allowed us to do more things, more accurately and at greater speed, a subtle strategic and conceptual revolution has also taken place. Systems adapted initially to shave costs or improve efficiency, end upif we give them half a chanceteaching us many things about our particular business and endowing us with new powers. For example, most of us no longer keep manual general ledgers or hand type invoices and checks. First, with computerized accounting packages, we marveled at their speed andif everything was input properlyincreased accuracy. Now, push that program a little further. You will discover the ability to perform highly complex analyses about your business that would have taken hours or been impossible by longhand. Through computers, What ifs? become Can dos. As we review some basic shipping concepts, please keep in mind the total package of powers behind the software and hardware of today's modern business world. What Is Shipping? Shipping can be defined as the preparation and processing of merchandise or material for transporting to a designated receiver. From the first camel caravans that crossed deserts to the first ships to sail the seas, shipping has always had the same basic challenge: the shipper must give his goods to the carrier for delivery to the receiver or consignee. The shipper gives a list of what is being shipped to the carrier, called a manifest or bill of lading. The fee for delivering the goods is usually determined by the weight, size, service level (air or ground), and destination of the shipment. The carrier then delivers the goods to the consignee who signs to accept them. This whole cycle, with its documentation, provides proof of shipment and proof of delivery to protect against negligence or loss by any of the parties involved. It is not a simple job for any shipping department to compare rates, fill out forms and tags, and label packages, especially when there are 50 or more to be picked up on the same day. Imagine the time required to fill out and maintain the documentation for all those parcels. Errors and delays occur. What Is Computerized Shipping? Computerized shipping is a process whereby a computer computes the charges, produces the documentation, and communicates the results to accounting and customer service. A basic computerized shipping system consists of a computer, interfaced to an electronic scale, label printer, and report printer. Sometimes additional printers are used to print COD tags, Bills of Lading, or other documents. A modem is usually utilized for transmitting to and receiving data from the carrier. A bar code scanner can be utilized to input a work order number or package identification number. Today, most computerized shipping systems are interfaced to an organization's host computer, sometimes with a protocol converter, where the order entry or accounting system resides. What Really Happens In the case of a computerized shipping system, a transformation takes place similar to the one we discussed with accounting systems. It's so easy to tap a computer key and think we are just weighing a package or printing a label, as we did manually for so long. But an interfaced, computerized shipping system can serve as an all-in-one traffic manager, shipping clerk, and communicator with customer service and accounting. Among its powers, it can select the least expensive parcel carrier, generate appropriate carrier compliant bar code labels, and provide for instant invoicing. These systems can also reduce labor costs in shipping and accounting, improve customer satisfaction, and enable customer service to instantly respond to inquiries. All this can lead to improved cash flow and increased profits. Perhaps even more importantly, managers and staff have more control of the shipping process and the power to integrate shipping into a total business strategy, on everything from inventory control and profit margins to staffing levels and customer service benchmarks. Yes, we do start by holding a package in our hand. In the end, through understanding the power of computerized shipping systems, we can take our business to places we never thought possible.